Kids like snacks. Who am I kidding – I like snacks. Having something in your cupboards that you can grab on your way out the door, that doesn’t need to be prepped or refrigerated, is super handy. These days there are countless packaged snack options at the store for convenience for a busy family – but these generally come with wrappers, destined for the landfill. Not great if you are striving for zero waste. Of course a piece of fruit is the ideal zero waste snack (just bring home the peel or core for your compost bin). But sometimes your kiddos (and you!) just don’t want fruit, or want something with your fruit. What’s a busy family to do? Homemade popcorn from bulk kernels. I like to make a big bowl on Monday, jar it, and it stays fresh until Thursday, if it doesn’t get eaten before then. 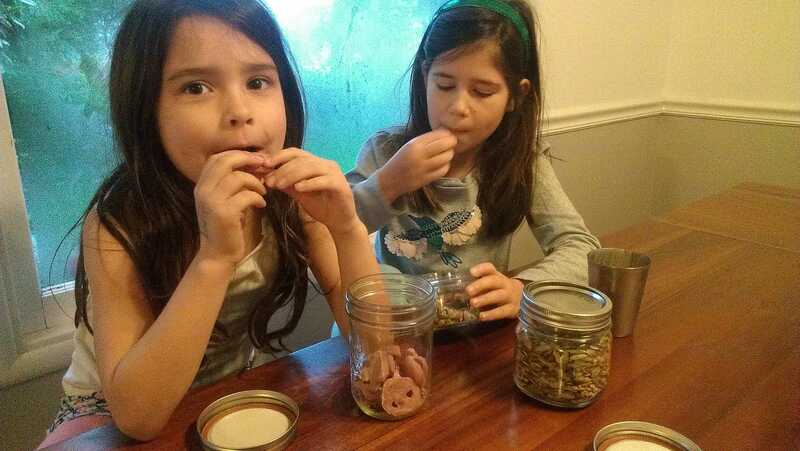 And here are my kiddos enjoying some snacks from the bulk bins. What are your favorite bulk bin snacks? How do you snack on the go and still strive for zero waste? I’d love to hear in the comments below!